Vancouver, BC / TheNewswire / November 6, 2018 - Global Energy Metals Corporation TSXV:GEMC | OTCQB:GBLEF | FSE:5GE1 ("Global Energy Metals", the "Company" and/or "GEMC") is pleased to report exceptionally positive results from the initial metallurgical program conducted over the northern quartzite zone of the Millennium Cobalt Project ("Millennium") in Mt. Isa, Queensland Australia. "Having achieved these excellent metallurgical results is remarkable at this growth stage of project development. The 2018 drilling program at Millennium confirmed previous exploration work further demonstrating that this deposit has exceptional cobalt mineralisation continuity over a significant area and is open along strike and at depth, increasing the potential for resource expansion. Following our highly anticipated outright acquisition of the project we look forward to rapidly advancing the Millennium Cobalt project on all fronts including further drilling and additional metallurgical studies planned for 2019." - Production of separate cobalt (Co) and copper (Cu) rougher concentrate streams is possible. - It is expected that the concentrate grades may increase on re-grind and final cleaner floatation. This test-work will be conducted in 2019. GEMC has entered into a binding agreement (the "Agreement") with joint venture partner Hammer Metals ("Hammer") to acquire the balance of the interest in the Millennium Cobalt Project as well as the Mt. Dorothy Cobalt Project and the Cobalt Ridge Project (collectively the "Mt. Isa Projects"), such that it will hold 100% of both Millennium and the Mt. Isa Projects. This accelerated acquisition of cobalt rich assets positions GEMC as the region's leading cobalt explorer/developer building a district-scale cobalt opportunity in Queensland Australia's Mt. Isa prolific mining jurisdiction. (3) determine the main cobalt and copper minerals in concentrates. 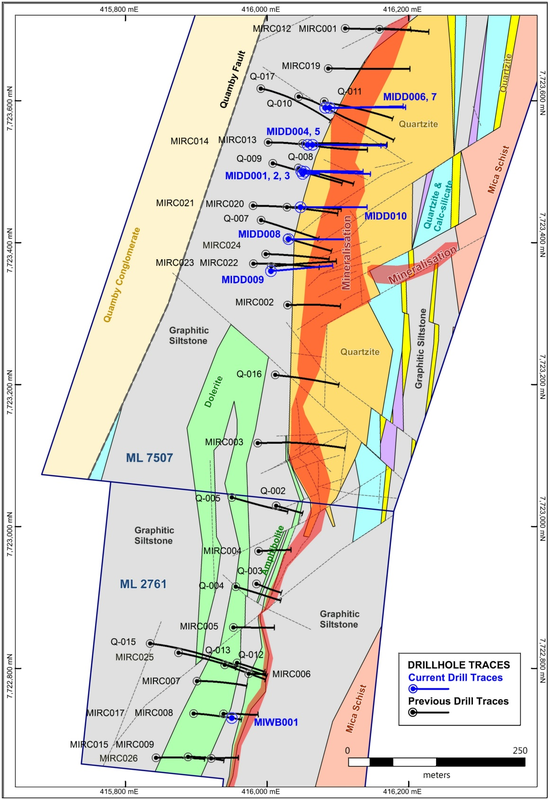 Quartzite is the main host lithology for this domain at Millennium and, as expected, the comminution test work reported results are indicative of a silica rich gangue material. The SMC test classified the composites as "very hard", abrasion tests as "slightly abrasive" and the Ball Mill index test as "hard". The location of the northern quartzite domain (shaded in orange).